PATRIOTIC? State Sen. Jen­nifer Wex­ton wants to endow Vir­ginia law-enforce­ment agen­cies with Patri­ot Act pow­ers. FA Update: Virginia’s Repub­li­can-con­trolled Sen­ate and House have enrolled (passed) Sen­ate Bill 919 (text here), and House Bill 1946 (text here). House Bill 1946 was signed by the House Speak­er March 6, and Sen­ate Bill 919 was signed by the Sen­ate Pres­i­dent March 7. Demo­c­ra­t­ic Gov­er­nor Ter­ry McAu­li­ffe is expect­ed to sign them into law. Vir­ginia law­mak­ers want to give local and state author­i­ties the same sweep­ing search-and-seizure pow­ers used by the FBI and oth­er fed­er­al agen­cies under the Patri­ot Act. Sen­ate Bill 919, by state Sen. Jen­nifer Wex­ton, D-Lees­burg, passed 39–1 last month (Jan­u­ary, 2015). A sim­i­lar mea­sure, House Bill 1946 by Del­e­gate Jen­nifer McClel­lan, D-Rich­mond, awaits action. “You’ll nev­er know you’re being inves­ti­gat­ed,” White­head told Watchdog.org in an inter­view. Bypass­ing the reg­u­lar search war­rant process, law-enforce­ment agen­cies could rifle through finan­cial trans­ac­tions, phone logs, com­put­er records and oth­er per­son­al data with­out obtain­ing a judge’s approval. Fit­ting­ly, the Wex­ton-McClel­lan mea­sures are qui­et­ly rolling through the Gen­er­al Assem­bly with lit­tle or no pub­lic notice. 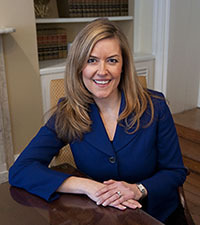 State Sen. Chap Petersen, D-Fair­fax, was the lone vote against Wexton’s bill. “It’s a bad idea — I can’t believe no one else vot­ed no,” he told Watch­dog. “The Writs of Assis­tance (gen­er­al war­rants) were passed by Par­lia­ment in vio­la­tion of the com­mon law stan­dards of being signed by a judge, after oath and affir­ma­tion of a wit­ness, and describ­ing with speci­fici­ty the place to be searched. Those stan­dards are found in the Fourth Amend­ment. Vir­ginia has come full cir­cle,” Fitzgib­bons said. Nei­ther Wex­ton nor McClel­lan respond­ed to Watchdog’s requests for com­ment by dead­line. McClel­lan did have time, how­ev­er, to post a salute to State Police who filled the House gallery on Tues­day. “Thank you to the Vir­ginia State Troop­ers for their ser­vice to the Com­mon­wealth,” she retweet­ed, with pho­tos attached.